April 11, 2019: successful commissioning tests of the gyrotron complex delivered to the Huazhong University of Science and Technology (HUST) in Wuhan, China. The complex is based on a specially designed gyrotron operated at a frequency of 105 GHz and producing an output power of 500 kW in pulses up to 1 second long. The gyrotron complex will work as a component of the electron-cyclotron plasma heating system in the J-TEXT facility. April 2, 2019: successful tests of the gyrotron designed for operation as a component of the Large Helical Device at the National Institute of Fusion Science (NISF), Japan. The gyrotron operates at a frequency of 56 GHz and produces and output power of up to 400 kW in pulses up to 1 second long. Application of the gyrotron in LHD experiments is scheduled for October 2019. In cooperation with GYCOM, a team of IAP researchers headed by the Acting IAP Director, Corresponding RAS Member Grigoriy Denisov developed a unique microwave complex based on 45 GHz gyrotron, which produces automatically adjustable radiation power from several tens of watts to 20 kW. The complex is designed for application in a fourth-generation superconducting electron cyclotron source of ions FECRAL, which, in its turn, will be used in the heavy-ion beam accelerator HIAF proposed by the Chinese Academy of Sciences. As an elements of such a system, the microwave source should satisfy very strict requirements imposed both on the parameters of the generated radiation and on the possibility of being integrated in large-scale research facilities. A team from the Chinese company ENN visited GYCOM on December 24, 2018. The head of the delegation, Dr. Minsheng Liu, ENN Vice-President and Director of the Fusion Research Institute (FRI-ENN) made a presentation about the controlled-fusion research program. The plans of cooperation in the field of equipping the spherical Tokamak, which is being built now, with a plasma heating gyrotron complex operating in the 28 GHz frequency range at a pulse duration of up to 5 seconds and a power of 400 kW. On October 25, 2018 GYCOM hosted a meeting of Gian Piero Galleranо, Director of Research and Head of the "Radiation Sources, Antennas and Diagnostics Laboratory" at ENEA-Frascati and a representative of ENEA (Italian National Agency for New Technologies, Energy and Sustainable Economic Development), with a team of Nizhny Novgorod specialists. In particular, they discussed the issues of Russia’s participation in the program of equipping the Divertor Tokamak Test facility (Tokamak DTT), which is being built now, with gyrotron systems for electron cyclotron plasma heating operating at a base frequency of 170 GHz. Factory acceptance tests of the gyrotron complex were performed on September 21, 2018 at the National Fusion Research Institute (South Korea). The complex is based on the unique dual-frequency gyrotron operating at frequencies of 105 and 140 GHz and producing a megawatt level of the output power at the both frequencies and pulse durations of up to 300 seconds, which was developed and manufactured by GYCOM in cooperation with the Institute of Applied Physics. The complex will be used for electron cyclotron plasma heating in the Korean Superconduction Tokamak Advansed Research (KSTAR) facility. On October 09-13, 2017, the Factory Acceptance Tests (FAT) of the first gyrotron complext to be delivered for the ITER Project were peformed successfully at GYCOM. Representatives of the ITER International Organization (Carolina Darbos) and the ITER Russian Domestic Agency (Alexander Ustinov) were present. In the process of the tests, the required contractual parameters of the gyrotron complex were demonstrated, and a joint protocol was executed based on the test result. The Protocol Conclusions read that the gyrotron demonstrated excellent stable results. The celebration of the 25th anniversary of GYCOM Ltd. took place on March 16, 2007 in the Home of Actors in Niznny Novgorod. Among the guests of the event were GYCOM employees, colleagues from the Institute of Applied Physics, GYCOM business partners, and many officials. On this occasion, a new booklet has been published. GYCOM Ltd. was an organizer of the FRONTIERS OF NONLINEAR PHYSICS International Conference, which took place on July 17-23 onboard "Nizhny Novgorod" river boat. The Institute of Applied Physics of the Russian Academy of Sciences (IAP RAS) and GYCOM Ltd. (Nizhny Novgorod) take part in the ITER Project on the Russian side. They produce gyrotrons: systems for plasma heating at the electron cyclotron frequency. IAP RAS researchers invented the gyrotron, thus pioneering development of such systems, and IAP RAS, together with GYCOM Ltd. are currently world leaders in this field. Alexander Litvak: As of now, only our gyrotrons are ready for ITER experiments. Interview to OTR, "Gamburgsky Sch'ot", 10 December 2015. Currently, superpower microwave generators from Nizhny Novgorod are known in many scientific centers of the world. Physicists from Nizhny Novgorod take part in largest worldwide projects including the ITER facility. Our city (called Gorky then) was a "closed' city only twenty five years ago, and Academician A. Sakharov was sent here to live in exile. We are talking about these changes in the life of scientists with Alexander Litvak, Scientific Supervisor of the Federal Research Center "Institute of Applied Physics of the Russian Academy of Sciences". Visit of the Indian delegation to IAP RAS. A group of scientists from India visited IAP RAS on 1-2 December, 2015. The group included researchers from the Institute for Plasma Research, (Gandhinagar), Shambhu Laxmikanth Rao, Leader of the ITER Electron-Cyclotron Heating Group in India, and Baruah Ujjwal Kumar, Manager of the ITER ECRH Power Supplies Group in India. The popular lecture "Gyrotron: Invented in Gorky" was delivered by Mikhail I. Petelin, Chief Researcher of the Institute of Applied Phhysics, RAS at 15:30 on 3 December 2015 in the IAP RAS Conference Hall. At its Seventeenth Meeting(IC-17), held on 18-19 November 2015, the ITER Council reviewed the progress made by the ITER Organization Central Team (IO-CT) and the Members’ Domestic Agencies(IO-DAs). Russia has fully met its obligations for delivery of superconductor cable for ITER magnets and the gyrotron complex prototype facility has passed its acceptance tests. The prototype of the ITER gyrotron comples including a microwave generator (gyrotron) having a frequency of 170 GHz, a power of 1 MW, a pulse duration of 1000 s, and an efficiency of 55%, a superconducting magnet, auxiliary magnets, power supplies, a cooling system, a control system, and other auxiliary systems, has been manufactured, and its operability has been demonstrated. Success of the tests was confirmed by the committee and mentioned by the ITER International Council. Photo: prototype of the ITER gyrotron complex during the tests at the IAP/GYCOM testing facility. The joint IAP RAS / GYCOM Ltd. / RTSoft Ltd. / RF DA delegation took part in the review of the final design project of the gyrotron complexes delivered by the Russian Federation to the ITER site on 5-8 October, 2015. The review took place at the site of the ITER International Organization in Cadarache, France and was performed by a committee including representatives of the ITER IO, as well as experts from USA, Germany, Japan, and Spain. The project will be approved after several comments have been addressed. A new installment of the "Horizons of the Atom" show about implementation of the ITER Project was shown by the "Russia 24" TV channel on October 17, 2015. Congratulations on the 20th anniversary! The management of GYCOM Ltd. congratulates the staff of the Moscow Branch with the 20th anniversary. During these two decades, your team has fulfilled a great scope of works on development, manufacture, and commissioning of high- and super-power gyrotrons for fusion facilities. The devices created by your team work in many leading scientific centers working in the plasma heating research field. We wish the staff of the Moscow Branch new creative and production achievements. This Russian abbreviation is the name of many facilities all over the world, in which plasma is confined in a magnetic field in the process of fusion. Read more about the ITER Project and, in particular, about GYCOM’s contribution to it on the “Argumenty i Fakty” site. During the inception visit of the Chinese delegation to the Department of Plasma Physics and High-Power Electronics of the, members of the delegation had a meeting with E.V. Sokolov, GYCOM Director. The participants of the meeting discussed possible fields of scientific and technical cooperation. See more details on the IAP RAS site. On September 5, 2014 V.P. Shantsev, Acting Governor of Nizhny Novgorod Oblast visited the Institute of Applied Physics of the Russian Academy of Sciences. The head of the Oblast had a meeting with Academician A.G. Litvak, IAP RAS Director, and visited several laboratories including the laboratories of GYCOM Ltd, where he reviewed the products and activity lines of GYCOM. The 9th International Workshop "Strong Microwaves and Terahertz Waves: Sources and Applications" organized by GYCOM Ltd. and the Institute of Applied Physics of the Russian Academy of Sciences, among others, took place on July 24-30 on board "Georgiy Zhukov". GYCOM staff members took part in the Workshop. Gyrotron + tokamak = synthesis? А popular science film about controlled fusion as a new power source and application of gyrotrons for plasma heating in tokamaks. In 2014, GYCOM sponsored the XIII A.D. Sakharov International Art Festival "Russian Art and the World" (June 3-16, 2014). Prominent authors from Russia, Italy, France, Hungary, and the USA took part in the Festival. This biennale, which is held in Nizhny Novgorod, is by right called one of the brightest events in the cultural life of Russia. Since 2000, GYCOM has been one of the permanent sponsors of the Festival. GYCOM Ltd. took part in the program TECHNOLOGY UPDATE RUSSIA TODAY. The coverage included video materials about the visit of Prof. Motojima Osama, ITER General Director, to Nizhny Novgorod, Institute of Applied Physics of the Russian Academy of Sciences, and GYCOM Ltd., an interview of Evgheniy Maksovich Tai, Director of the Nizhny Novgorod branch of GYCOM, and materials about the use of gyrotrons in the ITER facility. The gyrotron is a Russian invention, as well as the tokamak. 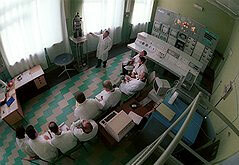 It was conceived by the researchers in the Nizhny Novgorod Radiophysical Institute (NIRFI) in the middle of the 1960s. The research team was led by Andrey Viktorovich Gaponov-Grekhov, a student of Academician Alexandr Alexandrovich Andronov who moved to Nizhny Novgorod in the early 1930s. Has extra-class applied science survived in Russia? Top-rank scientists and engineers are involved in the International Thermonuclear Experimental Reactor (ITER) Project. The ITER team includes specialists from the Institute of Applied Physics of the Russian Academy of Sciences (IAP RAS, Nizhny Novgorod). Gyrotrons for the ITER Project will be manufactured by the Scientific and Production Enterprise "GYCOM" in cooperation with IAP. Vladimir Ivanovich Ilyin, member of the Kurchatov Institute team, GYCOM stockholder, died suddenly on Saturday, 14 September 2013, at the age of 63. On 28 August 2013, Professor Osamu Motojima, General Director of the International Organization ITER, made a working visit to the Institute of Applied Physics and the Research and Production Enterprise “GYCOM”. Physics from Nizhny Novgorod will make gyrotrons for the International Reactor. Article in Novoe Delo Weekly, No. 6: Young specialists are sought for by GYCOM. One of the largest enterprises of our city is proud of the stability of its team. Dmitry Medvedev took part in the ceremony of awarding Prizes of the Government of the Russian Federation of Year 2011 in the field of science and technology. The list of winners included megawatt gyrotron systems being a breakthrough research line in the fusion power industry. GYCOM Ltd. (GYrotron COMplexes) has been developing and manufacturing unique electronic superpower vacuum microwave devices generating in the millimeter wavelength band, primarily, gyrotrons. The 24th Joint Russian-German Meeting on ECRH and Gyrotrons took place at IAP RAS (Nizhny Novgorod) on June 11-15, 2012. In 2012, GYCOM Ltd. celebrated its 20th anniversary. In the same year, GYCOM was awarded the State Prize for Scientific and Technical Developments of the Government of the Russian Federation. V MIRE NAUKI (World of Science), April 2012, No. 4. Alexander LITVAK, Director of the Institute of Applied Physics on overcoming the obstacles between science, production, and the today level of teaching. ".... One of the best-known results of the Institute's works is high-power sources of microwave radiation, specifically, a device called 'gyrotron.... Indeed, the gyrotrons developed by IAP are used currently in two thirds of the leading fusion laboratories of the world." Academician Alexander G. LITVAK, Director of the Institute of Applied Physics of the Russian Academy of Sciences, Works Supervisor; Grigoriy G. DENISOV, Corresponding Member of the Russian Academy of Science, Head of Department at IAP; and Vladimir E. ZAPEVALOV, Ph. D., Head of Laboratory at IAP; Vladimir I. ILYIN, Cand. Phys.-Math. Sci, Head of Laboratory, Institute of Physics of Tokamaks, Federal Research Center "Kurchatov Institute"; Vadim E . MYASNIKOV, Cand. Tech. Sci., Scientific Supervisor of the Moscow Branch of GYCOM Ltd.; Leonid G. POPOV, Head of Sector and Sergey V. USACHEV, Chief Specialist, Moscow Branch of GYCOM Ltd.; Evgheny V. SOKOLOV, Cand. Phys.-Math. Sci, GYCOM Director; Elena A. SOLUYANOVA, Cand. Phys.-Math. Sci, Head of Dept., and Evgheny M. Tai, Deputy Director, GYCOM Ltd. - for development and launching of industrial manufacture of megawatt gyrotrons for electron-cyclotron plasma heating in large-scale fusion facilities. The early 1990s were one of the hardest periods in the history of Russian science.The most vulnerable area was fundamental science. Budget funds were insufficient to pay even minimum acceptable wages. In this situation, the Institute of Applied Physics of RAS in Nizhny Novgorod proved to be a lucky exception. Its specialists found an opportunity to commercialize their developments, thus saving the Institute. Politics & Business Magazine "PolitEkonomika.Ru"
Interview with Academician Alexander G. LITVAK, Chairman of Nizhny Novgorod Scientific Center of RAS, Director of the Institute of Applied Physics of the Russian Academy of Sciences.